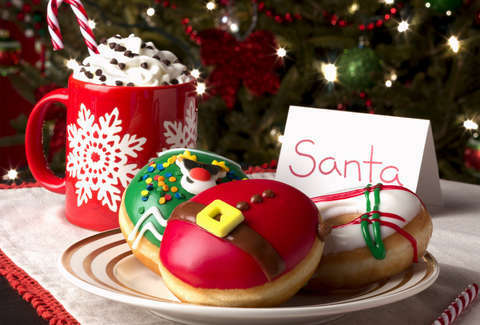 Ugly Sweater parties have become one of the most highly anticipated parts of the holiday season, and Krispy Kreme is capitalizing on that with the newest addition to their collection of festive sugary dough rings. The company announced the return of its holiday donut collection on Wednesday, unveiling four festive fried desserts dressed up for the occasion. The collection includes some familiar fares and one new one: the Ugly Sweater Donut. Krispy Kreme’s Ugly Sweater Donut is dipped in green icing (the sweater base, of course), topped with confetti and outfitted with objectively cute reindeer and penguin confections. The over-the-top donut is meant to replicate a busy sweater one might sport to an ugly sweater celebration. The purveyors of fried dough and sugar describe the new donut as a “tasty new take on the festive ugly sweater trend,” and well, we’re totally here for it. The Ugly Sweater Donut joins Krispy Kreme’s already-popular Christmas collection, which includes a chocolate-filled Santa Belly Donut, Holiday Plaid Donut, and a decidedly less Christmasy, but still delicious, Chocolate Iced Sprinkle Donut, available through December 24. 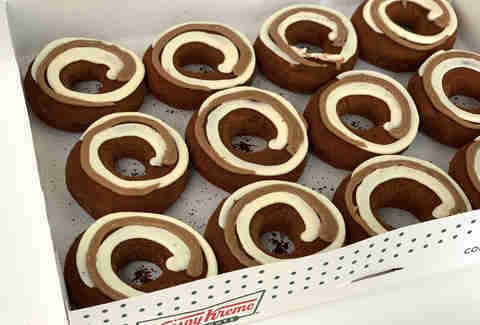 Earlier this month, Krispy Kreme also introduced an all-new Cinnamon Swirl donut, which is basically a cinnamon roll in donut form. It’s made with Krispy Kreme’s classic donut hand-tossed in cinnamon sugar and topped with both cream cheese icing and a gooey cinnamon swirl. Krispy Kreme’s 2018 holiday collection also includes a little festive fuel in the form of their new Peppermint Mocha. The coffee drink, which combines espresso, dark chocolate and peppermint flavor topped with whipped cream and tiny chocolate chips, surely pairs perfectly with your preferred Krispy Kreme treat and will help get you through the holiday season. This holiday lineup won’t be available for long, so hit up your local Krispy Kreme before they switch back to regular menu.